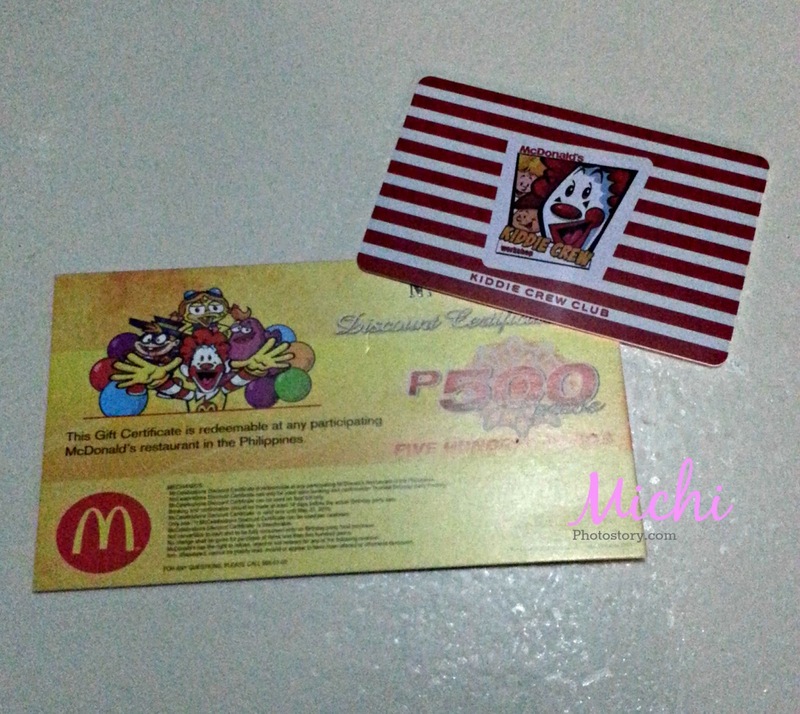 Two weeks ago my friend told me that we can claim our gift certificate from McDonald’s, it is free for those who enrolled in McDonald’s Kiddie Crew. So after our hearty lunch in Vikings we went to McDonald’s to claim our GC. 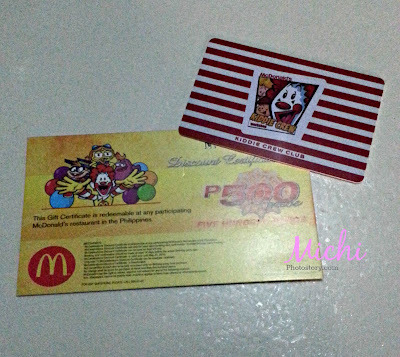 We received McDonald’s Kiddie Crew Club Card and P500 Gift Certificate that we can use when we book McDonald’s party packages. The first time I had this card was 6 years ago and I was able to use it in my son’s 1st birthday party. At that time I got 10% discount in our birthday party food bill but now they only give P500 discount. What are the Benefits of Mcdonald’s Kiddie Crew Club? 1.A kid (with guardian) should present the KCC to the cashier upon purchase of a McDonald’s Happy Meal to get the freebie of the month. 2.Freebie of the month will be handed out with the receipt of the date and point of purchase only. 3.A “No KCCC, No Freebies” policy will be strictly implemented across all stores. 4.In case any of the featured products (e.g. Happy Meal) are not available, the kid may substitute it with any of the remaining featured products. 5.Kid must meet the required purchase requirements for each category to qualify for the redemption of featured freebies. 6.Valid only in participating McDonald’s restaurants in the Philippines. 7.Not valid for Large Food ORders (G.O.L.D) and McDelivery. 8.Not valid with any other promos. 9.Transactions with senior citizen, PDS and Vat exemption are disqualified for this promo. So if you enrolled you kids in Mcdo Summer Kiddie Crew and haven’t received your Kiddie Crew Club Card yet, claim it as soon as possible so you can enjoy the benefits. I would recommend this to other parents. Activities like this will teach kids a lot of lessons that they probably wouldn't learn in the classroom ---- customer service, teamwork, hardwork, plus they'd boost their self-esteem as they develop their social skills even better. My son enjoys Mcdonald’s Kiddie Crew Club a lot. We were able to use the discount nung nag birthday son ko.